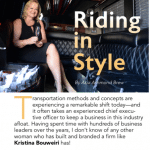 Reston Limousine President and CEO, Kristina Bouweiri, was recently interviewed for MBE Magazine. In the interview, she talks about how she proudly led Reston Limousine to become the 8th largest fleet in the country and also launched the monthly women’s networking event, Sterling Women. She addresses how her marketing and branding expertise have helped Reston Limousine grow into one of the most recognizable companies in the DC area, and discusses the future of Reston Limousine and the company’s push to hire more drivers. She also discusses how the development of autonomous driving will affect the transportation industry. This interview provides insights into Kristina’s leadership and marketing methods and how she has become one of the DC transportation industry’s most influential figures. You can read the full article in the link below.